Marlin Briscoe lives a quiet life in Long Beach, California. He enjoys his family, friends and golf — a whole lot of golf. Retired for several years from his position as the director of a Long Beach Boys & Girls Club, Briscoe still volunteers as a football coach for a high school near his home. The players know little about their soft-spoken coach’s background. They don’t know he’s a pioneer. They don’t know he broke through barriers. They have no idea that they’re being tutored by the first African-American quarterback to start in the game’s modern era. Briscoe, now 72, rose from the bottom of the Denver Broncos’ depth chart in 1968. After racism ended his career as a passer, Briscoe reinvented himself as a Pro Bowl wide receiver. He also rebounded well in retirement, recovering from a drug problem that briefly landed him in jail twice. Although Briscoe’s story isn’t widely known, he paved the way for future generations of black signal-callers in the NFL. Just ask some of the men who benefited from his struggle. In the United States in the late 1960s, you were more likely to see a unicorn than a black man under center in pro football. As the first African-American quarterback in the old American Football League, which in 1970 merged with the National Football League, Briscoe shattered the glass ceiling that existed in both leagues. But for Briscoe, just putting himself in position to accomplish the feat was an ordeal. From his first day in youth football in Omaha, Nebraska, Briscoe had played quarterback. The strong-armed passer with sprinter’s speed — he was sort of the Randall Cunningham of his time — starred at Omaha University (now University of Nebraska, Omaha). At only 5-foot-10, 177 pounds, Briscoe lacked the prototypical size of a top NFL quarterback prospect. Of course, it wouldn’t have mattered if Briscoe had stood 6-foot-4 and weighed 220: The NFL and AFL didn’t draft black men to throw passes. 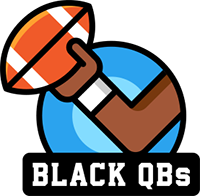 No matter how talented and accomplished they were, African-American college quarterbacks were shifted to other positions in the pros. Intending to convert Briscoe to a defensive back, Denver selected him in the 14th round of the draft. Briscoe, however, refused to sign with the Broncos unless they agreed to include him in a three-day quarterback tryout at the start of training camp. Why do we even watch the NFL anymore? Management met Briscoe’s demand, but the competition was stacked against him. As Briscoe recalled, he got the fewest reps of any of the players vying for roster spots. Despite impressing while throwing on the run and displaying accuracy on deep balls, Briscoe was moved to cornerback. Fate, however, intervened. The Broncos started 0-3 and were a mess at quarterback. On Sept. 29, 1968, Briscoe entered early in the fourth quarter of the home opener with the Broncos trailing, 17-10, against the Boston Patriots. Briscoe completed his first pass for 22 yards. On the next drive, he guided the Broncos 80 yards, covering the last 12 on a highlight-worthy touchdown run. Denver still lost, 20-17. The score, however, wasn’t the headline. “The thing I remember is the support I got from my teammates and fans … that was amazing,” Briscoe said. “Fans came up to me after the game. They were great. Back in those days, the fear was that white players wouldn’t follow a black quarterback and fans would be [angry]. That didn’t happen. A week later, Briscoe made his first start. He wound up playing in 11 games, including five starts, and passed for 1,589 yards with 14 touchdown passes — still a Broncos rookie record for touchdown throws. The elusive runner also rushed for 308 yards (with an impressive 7.5-yard average) and three touchdowns. Briscoe, who finished second in voting for AFL Rookie of the Year, had a great first season. Confident in his standing on the team, he returned to Omaha to work toward finishing his degree. Then, Briscoe got blindsided. The Broncos agreed to release Briscoe, who figured he would have many potential landing spots. As it turned out, he didn’t. “I found out that [Broncos head coach Lou] Saban called around to stop me from getting picked up,” Briscoe said. Eventually, Briscoe got a tryout with the Buffalo Bills, who were already well-stocked at the game’s most important position. Besides starter Jack Kemp, who would go on to become a successful politician, the Bills had backup Tom Flores (later a two-time winning Super Bowl coach) and rookie James (Shack) Harris, who played at historically black college powerhouse Grambling and also was a trailblazer: Harris was the first African-American quarterback to start and win an NFL playoff game. Briscoe moved to wide receiver and thrived. His first season in Buffalo, Briscoe had 32 receptions for 532 yards (a 16.6-yard average) and five touchdowns. The next season, Briscoe was selected first-team all-conference and second-team All-Pro after finishing second in the NFL with 57 catches and setting career highs with 1,036 yards (an 18.2-yard average) and eight touchdowns. In 1971, the Bills traded Briscoe to Miami for a first-round pick. Briscoe had a team-high four touchdown receptions for the Dolphins in 1972, helping them become the only team in NFL history to go undefeated. Briscoe won his second Super Bowl ring with Miami the following season. In 1976, at 31, Briscoe retired, never again playing the position he believes he was born to play. “What happened made me angry,” Briscoe said. “I proved I could do it and it didn’t matter. They took it away from me anyway. But I wasn’t going to give up and just walk away. “Yeah, it didn’t work out for me. But I feel what I did helped the guys who came after me. And I’ll always be proud of that.